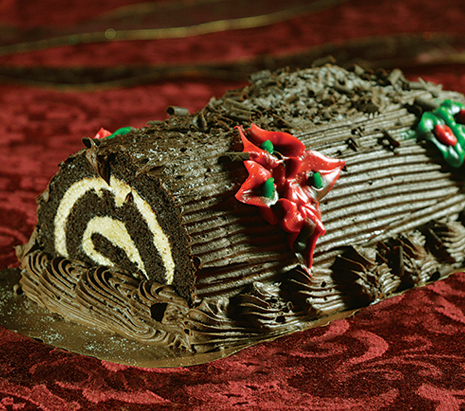 Description A Holiday tradition - Rolled chocolate cake filled with cappuccino mousse, frosted with rich, chocolate buttercream. Beautifully decorated with Holly Leaf frosting for your Holiday table. Serves 8 people. INGREDIENTS: sugar, cream cheese (pasteurized cultured milk and cream, salt, stabilizers (guar gum and carob bean gum)), eggs, bleached flour (bleached wheat flour, iron, niacin, thiamin mononitrate, riboflavin, folio acid). Topping (water, hydrogenated palm kernel oil, sugar, corn syrup, CONTAINS 2% OR LESS OF polysorbate 60. carbohydrate gum, artificial flavor, salt, sodium stearoyl lactylate, sorbitan monosotearate, sodium citrate, soy lecithin, xanthan gum, colored with annatto), high fat cocoa processed with alkali, soybean oil, shortening (palm oil, mono and diglycerides, polysorbate 60), creme filling (corn syrup (sulfur dioxide], sugar, water, tapioca starch, CONTAINS 2% OR LESS OF dried egg whites, salt, cellulose gum, tartaric arid, natural and artificial flavors, hydrochloric acid). CONTAINS 2% OR LESS OF THE FOLLOWING nonfat dry milk, whey solids, milk proteins, high oleic sunflower and, or canola oil, hydrogenated cottonseed oil, corn starch, invert sugar, annatto extract (color), citric acid, gum arabic, maltodextrin, preservatives (potassium sorbate, sorbic acid, tocopherols) ,red #3, red #40, turmeric (color), blue #1, yellow #5, food starch-modified, cocoa processed with alkali, corn syrup solids, chocolate liquor, TBHQ (antioxidant), sodium acid pyrophosphate, sodium bicarbonate, monocalcium phosphate, cocoa mass, cocoa butter, natural vanilla flavoring, artificial color, modified corn starch, vegetable gums, preservatives (phosphoric acid, sodium proprionate), coffee, modified tapioca starch, calcium carbonate, whey powder, carageenan, gluco delta lactone, yellow 6, dextrose, wheat starch, non-hydrogenated plant fat (sal fat), magnesium stearate, unsweetened chocolate, cocoa butter, natural vanilla extract, heavy cream, ascorbic acid (vitamin C), vitamin D3. Contains: Milk, Egg, Wheat Soy. Manufactured on equipment that also processes peanuts and tree nuts.